We are delighted to launch our 2 new rattan garden dining sets for summer 2018 – the Bermuda and the Miami. - Available in various rattan and cushion colours. A fabulous 9-seater rattan corner dining sofa set with separate armchairs, that will allow you to use your outdoor space in style. Made from premium PE rattan weave and featuring removable and washable cushion covers this 9-seater rattan dining set will provide years of stylish enjoyment. Featuring a tempered safety certified glass table top you can be assured that safety and quality is at the heart of this and every Abreo rattan garden furniture set. This set is our tranquil luxury set, with a feeling you will get lost in comfort on those long summer evening nights. A fabulous 8-seater rattan dining sofa set with 2 separate armchairs will allow you to use your outdoor space in style. Made from premium PE rattan weave and featuring washable cushion covers this light brown 8-seater rattan sofa set will provide years of stylish enjoyment. Featuring a tempered safety certified glass table top you can be assured that safety and quality is at the heart of this and every Abreo rattan garden furniture set. This entry was posted in Rattan Garden Furniture News on 05/04/2018 by Abreo. •	Introducing brand new grey rattan garden furniture to the Abreo range. •	Bring sophisticated and modern style into your garden, or conservatory, with these exclusive furniture pieces, at the lowest prices around. •	Choose from light grey or dark grey rattan, and from light grey and dark grey cushions to create the perfect statement for your garden. We are delighted to introduce these brand new, stunning grey rattan range for 2018. Exclusively available from Abreo, these sets will bring modern style and sophistication into your garden. As well as being perfect for your patio or decking, these pieces will also fit ideally in your conservatory or sun room. We have garden dining sets, rattan corner sofas, 4 seat sofa sets and more, all in the brand new grey rattan colours, and all with a free outdoor protective cover. This entry was posted in Rattan Garden Furniture News and tagged rattan, garden, furniture, cheap rattan garden furniture, abreo, abreo rattan, Patio, grey rattan, grey on 19/03/2018 by Abreo. Abreo rattan garden furniture is designed to be hard wearing and suitable for outdoor use and year round storage whatever the weather. Many customers keep their rattan garden furniture out in the garden over winter – with the only maintenance required being a quick clean with mild detergent before using it again in Spring. However, as an added protective touch we are pleased to include a FREE outdoor protective rattan garden furniture cover, worth upto £69.99, with selected sets purchased from our website (www.rattan-gardenfurniture.co.uk) for the extra piece of mind that your garden furniture will stay in its best condition for years to come – whatever the Great British weather throws at us!!! Click here to view the full range of rattan garden furniture NOW, including 9 seat garden dining table sets, cosy sofa sets and much more. This entry was posted in Rattan Garden Furniture News and tagged garden, furniture, rattan garden furniture, abreo, abreo rattan, home, Patio on 13/03/2018 by Abreo. What better way to make the best of balmy summer evenings or maximise the soft autumnal light than with a great outdoor lighting strategy? We all too often waste our outdoor space, but illuminating pathways and gardens helps to extend the use of gardens on warmer evenings and creates a beautifully atmospheric effect when the weather begins to chill. This is a great option for smaller gardens, especially when accompanied by a great seating plan. Even the tiniest of spaces can be perked up with dedicated areas for relaxation, and the choices of decking and patio options are almost limitless, meaning there’s no excuse not to give your outdoor space a quick and simple lift. Never underestimate the stunning effect of a few carefully chosen plants to the look and feel of any outdoor space. Whatever your preferences and possibilities, there is an option to suit – from potted plants to climbing vine varieties which enable you to breathe new life into your outdoor areas without diminishing existing space. At Abreo we are dedicated to making your space functional and beautiful. We specialise in stunning rattan furniture to create a beautiful, natural look which is eternally chic. Rattan is crafted from a light, durable woven material which has long made it a classic and popular choice for outdoor tables and chairs, as it is flexible enough to be made into almost any shape and design. Items such as the 5-Piece Milano Set in light brown seamlessly blend into any environment and are ultra-comfy, too! Don’t be disheartened from your outdoor project if certain things aren’t achievable due to space restrictions. With a little imagination and ingenuity, every single outdoor space can be made into something beautiful and uniquely suited to your personality and practical needs, so head to Abreo for some delightful garden inspiration. This entry was posted in Rattan Garden Furniture News on 02/02/2018 by Abreo. Abreo are delighted to introduce to you the new Monaco rattan garden furniture corner dining set. Having listened to those Abreo who asked for a larger selection of large rattan corner dining sets, Abreo has created the new Monaco. Designed with a unique modular construction the Monaco is versatile stylish and practical. The modular design allows users to create a variation of seating arrangements and styles to suit their needs. The Monaco set is not just extremely practical it is also extremely stylish, the modern clean design will create a high end look in any garden. With a sophisticated and minimalist design, the Monaco rattan set will add the wow factor to your outdoor summer dining in 2017. The Monaco rattan furniture set does not just look like a high quality piece of furniture, it has several high quality features incorporated in its design and construction. The Monaco has a UK safety certified tempered glass table top, this ensures you and your family can enjoy this fantastic set in your home and garden without the worry of what might happen if the glass top is damaged. The Monaco set also features UK Fire and Safety certified cushion covers and foam, this ensures all seating is safe to use inside and outside of your home, especially around naked flames such as candles, Bbq's or even patio heaters. This rattan set has been woven with specifically selected PE rattan material and not the inferior PU rattan material. PE has been specifically chosen because of its increased resistance to weather and the elements. Please don't settle for inferior PU rattan furniture, it has a much shorter lifespan and will deteriorate at a much quicker pace. Introducing The Monaco Rattan Dining Set Options. Dark Mixed Grey With Dark Grey Cushions. This colour combination is one of favourite colour combinations, it looks so expensive and will fit into virtually any garden colour scheme, due to its mixed grey weave colours. Dark Brown With Light Cushions. This colour combination is the ultimate classic garden furniture combination, for those of you that want a true classic colour combination that will never go out of style, then this is for you. With such a rich colour, this set would not look out of place on a cruise liner ship. The Black Monaco Rattan Garden Furniture Set is sleek stylish and will add glamour to your outdoor patio space. With the a very stylish combination of black rattan and dark grey cushions and black tinted glass table top, this Monaco set can only be described as chic. This dark mixed grey rattan weave combined with a set of light grey cushions adds a twist to the usual dark grey and dark cushion combination, this set still adds the modern style touch to any space but incorporates a light grey colour scheme to give this Monaco set a slightly edgier modern look. This entry was posted in Rattan Garden Furniture News on 13/03/2017 by ross. With the rattan garden furniture season fast approaching us this year, Abreo wanted to write a little blog post covering some of the frequently asked questions often asked regarding rattan garden furniture. The aim of this blog post is to cover in more detail the answers to many queries,that can not quite be covered in a simple FAQ drop down section. This will hopefully enable you to receive all the information you need before and after you have purchased an Abreo Rattan Garden Furniture Set. Does Abreo Garden furniture come ready assembled? No Abreo garden furniture does not come pre-assembled, we specifically choose to have our furniture constructed so it comes in a flat pack form, for the following reasons. Is Abreo garden furniture hard to build? The honest answer is No, Building Abreo garden furniture is not like building a famous Swedish furniture flat pack brand. Abreo furniture has very few components and the pieces fit easily together via bolts and it can be done by just one person. Abreo have sold over 25,000 sets of rattan furniture and that is because Abreo garden furniture is easy to build and has many advantages over using traditional preassembled garden furniture. (Tip - loosely hand tighten bolts whilst building your set, once all pieces are fitted together correctly, tighten all bolts fully.) We have a guide to building Abreo Rattan Garden Furniture here. Do I need any tools or special tools to build Abreo garden Furniture? Can I leave Abreo Rattan Garden Furniture Outside? Yes you can, Abreo garden furniture is specifically made from a PE rattan weave which enables Abreo furniture to be left outside. PE rattan has many benefits over traditional rattan such as it does not need repainting or treating, it is waterproof and is resistant to UV damage from the sun. All cushions supplied with Abreo rattan garden furniture are shower proof and covers are completely removable allowing them to removed if cleaning is required. Do I need to store my rattan garden furniture inside during the winter? No, you do not need to store your rattan furniture inside during the winter months, we do recommend that you cover your furniture with a waterproof cover. This will stop any dirt or leaves being trapped in the rattan weave whilst not in use and will reduce the amount of cleaning you will need to do, to ready your furniture for the spring season. You can find our rattan garden furniture cleaning guide here. If you do want to store your furniture inside during the winter months or when you are not using it, you can always dismantle your rattan set and store it with very little space needed. What are the benefits of the modular garden furniture sets? Abreo modular furniture sets have one fantastic benefit, they can be configured into a design you want, the modular sofa sets although extremely safe and sturdy can be moved apart in sections, this can aid with easy storage and moving its position within your garden, or if you need a different configuration altogether. We also sell the modular pieces individually if in the future you decide to increase the size of your modular set you can just purchase the extra pieces you need. How is Abreo Garden Furniture delivered? Abreo garden furniture is always delivered via 24hr tracked courier service. We are able to use a tracked delivery service because we can send your furniture packed in 2 or 3 boxes, this allows for a more efficient delivery service, we will never send your furniture untracked. On occasion if customers order a very large set or several garden furniture sets, we may send your furniture for delivered tracked on a wooden pallet. This allows our warehouse team to build a wooden frame and wrap and strap your products together, this will prevent damage to your order and stop large orders being split into separate consignments on different days by the courier. We do not charge extra for this service or for the extra cost of the pallet and wooden framing. Once the courier has delivered the pallet to your home, if they do not take it away with them, you are then free to keep the pallet or have it collected by your local pallet recycling service found via google, they will often pay you for the pallet and any payment you receive is yours to keep. Can Abreo supply me with spare rattan furniture parts? Yes we can, one of the many benefits of Abreo rattan garden furniture is the ability for parts to be changed as needed. Abreo hope you and your family use your furniture constantly but on occasion accidents can happen, instead of needing to buy a entriely new set of furniture, you have the option to contact Abreo and enquire about spare parts. Abreo have most spare parts in stock and we are always willing to help in any way. If there are any other questions you think should be covered in this section please let Abreo know, we would be happy to add them at a future date. We hope you have enjoyed reading this post about Abreo's most frequently asked questions. If you have any more questions Abreo would delighted to answer if you get in touch. This entry was posted in Rattan Garden Furniture News on 17/01/2017 by ross. Well lucky for you Abreo rattan garden furniture is here to answer all of your questions and show you some of the great rattan furniture we have available for you this coming spring. Which Rattan Garden Furniture is Best for Me? One of the most popular questions we are often asked is which rattan furniture should a customer buy. Now even though that is a very open question in regards to rattan furniture. We have a few great pointers and know what considerations you should consider before you purchase. We recommend one of the first considerations need to be how big is the space in your garden, conservatory or yard? This may seem like an obvious question but you will not only need to know if your chose rattan furniture set fits but how will you live with it taking up space if you don't want to move or store your furniture over the winter months. If you do want to store your furniture in a garage or outhouse during the winter months or when you are not using it, may be worth considering a modular set which can be easily split apart for moving around in comparison to a standard sofa set. Secondly we recommend you to think about how you are going to get the most use out of your rattan garden furniture, does your lifestyle suit relaxing or lounging in the garden or are you more likely to want to entertain friends and family in a more formal dining setting and then we have those of you who want everything. Well fortunately we have rattan furniture solutions for all these requirements. If you intend to use your rattan garden furniture for more relaxed lounging a modular or 3 piece rattan furniture set, would be the perfect solution for your needs. If on the other hand you wish to formally entertain your friends or family or you generally intend to use your furniture for dining, we would recommend our rattan dining sets. For the best of both worlds we have our 9 seater rattan corner set, this is a corner sofa set with cushioned stools ideal for lounging and entertaining large numbers but this set also comes with a dining table, allowing the set to be used for stylish formal dining situations and the dining table can be stored away when not in use, offering you the best of both worlds. A third consideration we recommend you consider is will you need to increase the capacity of your rattan garden furniture in the future for extra children etc. If this is a consideration for you we recommend you purchase one of our modular sets. Different parts of our modular sets are available to buy on their own and can be purchased at a later date to increase the size or change the design of your set. We do recommend you speak with our customer service team before you order to ensure we can supply you with cushions which colour match your current furniture. A fourth question we are often asked is will I be able to take my rattan garden furniture through narrow doorways when delivered. The answer is yes! We have dealt with over 25,000 rattan orders over the last few years and one of the major reasons why our furniture is so popular is because our rattan garden furniture is supplied in flat pack form. We designed our furniture in this way for some very good reasons, the main one was customer feedback. We can't tell you the amount of times we were asked if we could supply rattan furniture in flat pack form by our customers. Your thinking why would a customer want to construct their own furniture? Well for the following great reasons, if we sent out our furniture to you fully built, it would cost you the customer 3 times as much for shipping due to the each set needing to be delivered untracked in a van by 2 people on an economy service. Instead our rattan garden furniture is delivered free of charge in the UK fully tracked via a recognised international courier on a 24hr service. Being flat packed as mentioned before it makes it very easy to take the furniture set through narrow doorways or through your home if that is the only access point you have to your garden. The compact nature is also appreciated by people with roof terraces or customers who have to access their outdoor space via stairs or steps. For those of you who want to store their furniture away in the winter months you also have the option of taking your furniture apart again to aid storage and lessen the space it will take up in your garage or out building and the weight of the furniture you have to move. The final reason and one of the most cost effective benefits for the customer to want to buy their rattan garden furniture in flat pack form is the ability in the future for the customer to replace any damaged parts without having to replace an entire piece or set of furniture. Accidents do happen but when they do being able to resolve them as cost effectively as possible is so important, we believe our furniture is an investment for the future and not just a summer season. This entry was posted in Rattan Garden Furniture News on 05/01/2017 by ross. Everybody knows that here at Abreo we are massive fans of Scandinavian style furniture. So much so that we have hugely increased our range of Nordic inspired furniture pieces. We have massively increased our Scandinavian styles and colour options in-line with today's and tomorrows hottest trends. Not only that but we pretty much guarantee that we wont also be beaten on price, we have secured our best collection yet of Scandinavian furniture and we are able to deliver directly to our customers at fantastic value prices. In this blog post we are going to carry on from where we left off on our first guide to Scandinavian furniture, which you can read here. We are going to highlight some of our new range and some of our existing Scandinavian range which is now available in new colours, keep a special eye out for our grey Scandinavian furniture it is proving to be this seasons hottest colour! First up we have our fantastic Scandinavian TV stands, we have several variations of TV stand style in our Scandinavian range and the variation you require will depend on how much storage you require and what your favourite colour is. We would just like to point out that our Scandinavian range features solid wooden legs and handles, features which are usually only seen on Scandinavian furniture 3 times the price. Two of our standing dining room chairs are the solid wooden backed chairs and the new sleek soft cushion chairs. Our first chair is the very retro and stylish cushioned chair made from polypropylene with solid wooden legs. This chair is available in both grey and white and is very reminiscent of the classic 1960's Scandinavian design era. These Scandinavian dining room chairs will be a stand out piece in any home and are sure to impress all your guests including design aficionado's. The second chair in our Scandinavian collection is the very robust solid wooden chairs, these are available in both grey and white and also new for this year a really good quality oak veneer, these colour options are matched together with solid wooden legs and struts.. These chairs are completely solid, comfy and practical and will stand up to the modern day rigours of any busy home. Not only are they robust they are exceptionally good quality and will undoubtedly last the test of time. Our newest Scandinavian dining tables come in two different sizes and in three different colour variations. We have a solid white, solid grey and quality oak veneer table top variations all twinned with solid wooden legs to ensure the table has lasting quality and a solid and robust feel when in use. Inspired by the great Scandinavian furniture designers of the 60's these modern tables have all of the design features of any designer furniture piece but with the added appreciation of past great designs and features. The smallest Table size would be suitable to seat between two and four people and the largest size would be suitable to seat between four and six people. This seasons collection of Scandinavian living room furniture has been expanded we now offer several designs of coffee table a range of side tables and a fantastic range of nest and side tables. This range of furniture is available in white, oak veneer and grey and some selected pieces are available. Firstly we have our extremely popular white Scandinavian sideboard which we featured previously in our last guide here. We now have it in this seasons hottest colour grey! This has been so popular this season and is really on trend. So for those of you who would like to be a trend setter our grey Scandinavian sideboard is perfect for you. Secondly we have our new of Scandinavian coffee table which comes is available in both white and grey. Whether you need somewhere stylish to keep your TV as its extremely versatile or you just need that extra storage space from your coffee table we have what you need with this sumptuous piece. We have so many different sizes and varieties of Scandinavian furniture, you can create an entire matching selection for your home entirely from this style. Thirdly we have a fantastic white Scandinavian design TV stand. This truly has been one of the hottest selling items this season and with good reason, with its clean minimalist designer chic look and stunning form this TV stand will be an investment for the future as well as the present. It has an exceptional amount of storage space and is available to order in 2 lengths. Ensuring that the TV stand is suitable for all room sizes. Having viewed our collection of Scandinavian furniture I am sure you will agree that the collection has something for everyone, with Scandinavian furniture now the hottest trending furniture style, Abreo can offer you a piece of this desirable trend at very affordable prices and even if you want to create an entire collection we can allow you to this via interest free credit. This entry was posted in Scandinavian Furniture on 30/12/2016 by ross. Here at Abreo rattan garden furniture we like to use our rattan furniture outdoors as much as possible during the year and one way we can increase the amount of time we can use our rattan garden furniture sets is by using a patio heater. So we thought we would bring you our guide and recommendations to patio heaters that we think are excellent. As always here at Abreo we don't just want any old patio heater, we want to a heater that is stylish and excellent quality to match our rattan garden furniture sets. So we have searched far and wide to find you a brilliant collection of patio heaters that we know will become a stylish feature in your garden as well as being a practical investment. We are sure you will find a patio heater below that will meet all of your particular needs as well as links to the heaters listed. The Santini Gas Garden Heater from heat outdoors is a gas powered gas heater and is available in stainless steel or bronze colour. A fantastic quality heater with a push button ignition and wheels to ensure manoeuvrability at all times, the patio heater also importantly has a automatic cut off safety feature if the heater is ever tilted or knocked over. The Sahara table top garden heater from Calor is twist on the traditional garden heater. The heater sits on your garden table rather than on the floor and omits heat to the surrounding area. It comes with varied heat control and is made from Stainless Steel. This 360 degree infared patio heater from Chill Chaser is a luxury patio heater, the company is backed by one of the famous dragons from the Dragons Den TV programme. It features carbon fibre heating tubes which reduces carbon emissions by 95% perfect for the environment. It also comes with a zipped weather proof cover. The Veito blade is a wall mounted patio heater, which can mounted either horizontally or vertically, it has 4 power settings and come with a touch button remote control. It also comes with over heat protection and is waterproof, so is suitable for indoor and outdoor use. 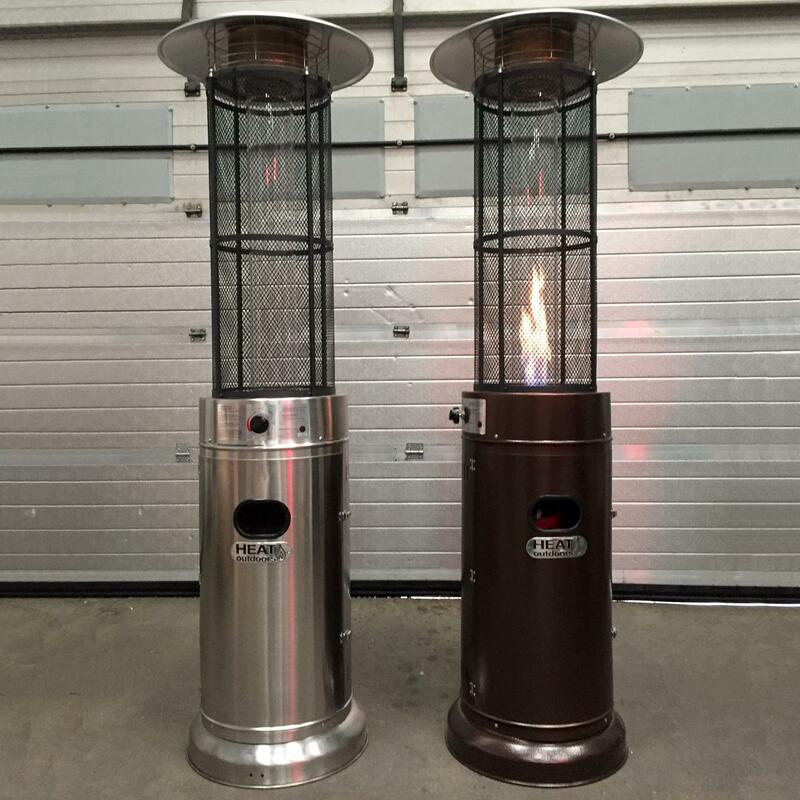 The Kaliente gas patio heater features a tube of flame, creating a spectacular feature. It has 3 heat settings and a special metal safety attached a safety precaution to prevent accidental touching of the flame. We would love to know what you think of our selection of patio heaters and whether you any other suggestions which could be added to our list. Please let us know in the comment section below. This entry was posted in Rattan Garden Furniture News and tagged garden, furniture, rattan garden furniture, abreo, abreo rattan, home, Patio, Patio heater on 07/09/2016 by ross. Abreo Rattan Garden Furniture is pleased to announce the launch of its sister website, Abreo Home Furniture. Following on from the successes we have had in being one of the UK’s largest suppliers of rattan garden furniture. The Abreo brand has decided to spread its wings and expand into the home furniture market. The Abreo brands Ethos of great customer service and quality furniture at cheap prices will continue, allowing current and new customers the chance to purchase great looking stylish furniture at extremely affordable prices, for any room in their home. With the Abreo track record of providing a high level of service, backed up with proven reviews on sites such as Trustpilot and consistent great feedback from our customers, it was inevitable that our fantastic customers would ask us to increase our furniture range. Selling over 25,000 rattan garden furniture sets over the last few years has enabled the Abreo team to develop and fine tune how we operate, Ensuring we can offer you the customer a fantastic service at the most competitive of prices. We recognised from the quantity of our customers who asked us to increase our furniture range and listening to their bad experiences of buying from other home furniture retailers in the market. That there was a desperate need for a supplier of home interior furniture within the UK who would supply home furniture at affordable prices whilst ensuring high levels of customer service to their customers. To continue offering our customers the best shopping experience we can the new Abreo Home Furniture website has been created with the user in mind, we have ensured that it is mobile friendly allowing you to browse our furniture collections on any device you own. Allowing you to compare our furniture to any you see when shopping on the high street. We are very confident we will compare favourably and that is why we are more than happy to suggest you try it yourself. The Abreo Home Furniture launch has focussed on our fantastic collection of Scandinavian style furniture, we know it’s this season’s hottest trend and can be seen all over the high street and inside glossy magazines. We have created our collection of Scandinavian style furniture which wouldn’t look out of place in any of the high end magazines but is available at a fraction of the high street price. We haven’t scrimped on quality or style we are simply supplying it directly to you and cutting out the high street retailer. Not only does our collection look great from afar but if you look up close you will also notice that our Scandinavian style furniture comes with solid wooden legs ensuring quality is second to none. Abreo Home Furniture really can add style to any room of your home, we have ensured that we can cater for your needs across your home and make a huge difference at very little cost. Our bathroom storage collection, not only allows you to hide away any clutter with innovative storage solutions, they will also add a great deal of style to the décor of your bathroom. Our launch collection of bathroom furniture is neutral modern and elegant and at unbelievably affordable pricing. For those of you who enjoy apartment living or enjoy the cosy spaces of your home, the Abreo collection of Charles Eames inspired dining chairs and dining tables can be adapted to fit into snuggest kitchen space or expanded to fill large dining rooms. The option is there for your every need and at the most competitive prices all backed up by our expert customer service team. Our living room furniture collection is filled with special Scandinavian style pieces with a range of coffee tables including circular and rectangular and this season’s hottest trend nest tables, all come with solid wooden legs and all will add high end style to any living room. To compliment the coffee tables we have created a selection Scandinavian style white side tables and white TV stands that match perfectly both again with the matching white colour and solid wooden legs. A couple matching Scandinavian furniture pieces in a room looks stunning. If your bedroom furniture is in need of attention then the Abreo Furniture collection of shabby chic furniture will enhance your boudoir without fail. The Abreo shabby chic collection comes in white, black, silver and natural oak colour options and will suit any taste. The shabby chic dressing tables are simply stunning and ensure your makeup routine is done in style. With matching chest of drawer options available and in several size options, you can immerse your bedroom in a total world of chic. Please visit www.abreo.co.uk and indulge in the world of Abreo Home Furniture. This entry was posted in Rattan Garden Furniture News and tagged furniture, abreo, home, side tables, chairs, dining tables, dressing tables, scandinavian, coffee tables, dining, makeup, tv stands on 22/08/2016 by ross.